Are you a better investor than a 13-year-old? 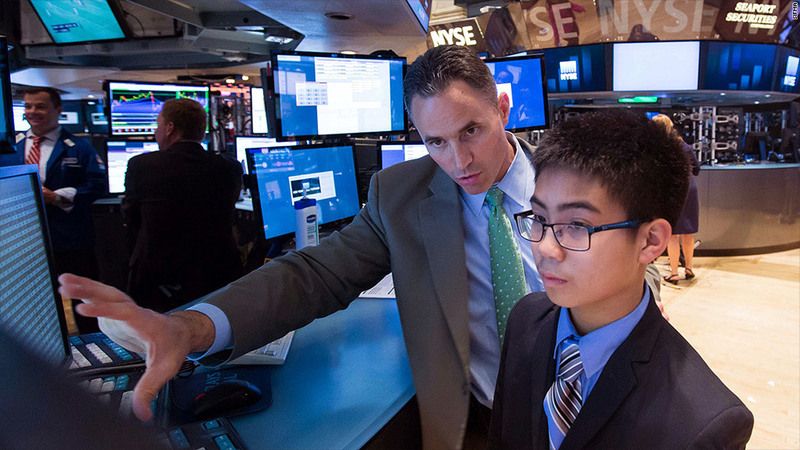 Sixth-grader Marcelo Bongalon gets schooled by an NYSE floor trader. One day in June, Marcelo Bongalon put on his best suit, a crisp tie, and a pair of shiny leather shoes and went to work on Wall Street. The sixth grader from San Francisco isn't exactly a veteran deal maker. Rather, he was one of four winners of the Securities Industry and Financial Markets Association's (SIFMA) Investwrite contest who were invited to visit the New York Stock Exchange last week to present their investment ideas and chum it up with the old timers on the trading floor. Hailing from middle and high schools throughout the country, the students had a simple, yet arduous assignment: Design a 10-year imaginary investment portfolio using a mix of stocks, bonds and mutual funds. Here's how the future masters of the universe put their money to work. 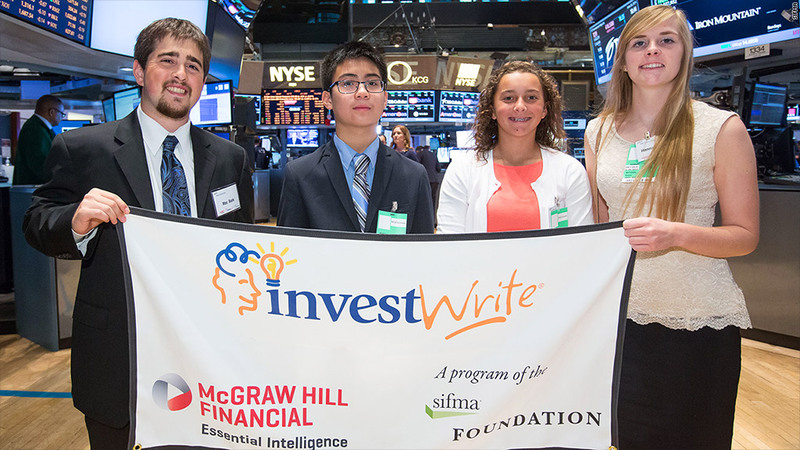 Marcelo Bongalon, 6th grade, San Francisco, CA: Prior to the Investwrite competition, Marcelo knew little about investing. When his teacher asked him about the market, he could only think of Warren Buffett, and he admits that he used to pronounce the legendary investor's last name like the type of dining setup in which eaters serve themselves. Since entering the competition, Marcelo's stock picking prowess began to emerge. After initially analyzing WalMart, (WMT) Marcelo began to look into Costco (COST)when his mom bought him a pizza and root beer from the retail giant. He liked what he saw, and chose to buy the company based on its international expansion, comparatively higher wages, and discounted gasoline sales. "I decided to buy Costco in honor of that delicious meal," joked Marcelo. It's too early to tell if his investment in Costco will pay off. The stock is down around 3% this year. Mac Bank, 12th grade, Bloomfield Hills, MI: Utilities are usually considered a defensive sector, favored by investors seeking safety and healthy dividend payments. But Mac sees a growth opportunity. The recently-graduated senior is betting big on water, specifically the American Water Works Company (AWK). "Without water a society will crash and burn, figuratively and literally," he wrote. He chose American Water Works because of the company's government contracts to build and maintain water facilities, as well as its investment in environmentally-friendly wastewater management technologies. Wall Street seems to agree with his assessment. 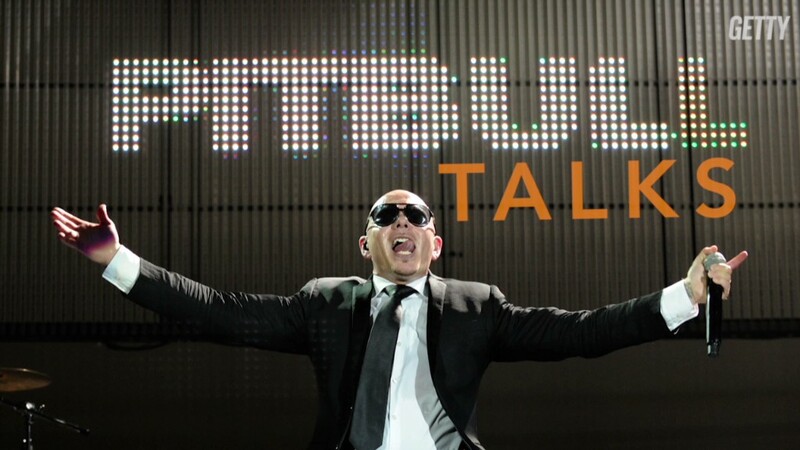 The stock is up 16% in 2014. Mac will begin his studies at the University of the Michigan in the fall, and plans to major in business and economics. As for a future career, he's keeping his options open, but his visit to the NYSE has lead him to at least consider life as a fast-talking trader. "It was amazing just to be on the floor," he says. "I was immediately enamored by the lights, the architecture, and the people." Olivia Dampier, 7th grade, Littleton, CO: With the goal of saving for graduate school, Olivia is bullish on retail, particularly WalMart (WMT) and Home Depot (HD). As for WalMart, she believes the company will benefit from its sheer popularity and low prices. They "have everything," as she put it. Olivia's Home Depot investment is based on her faith in the American recovery. She thinks as the economy improves, the home improvement retailer will benefit significantly from an increase in home renovations. Wal-Mart is down 4% so far this year. Home Depot is about flat for the year. Hannah Brawley, 12th grade, Vestavia Hills, Alabama: Hannah is playing an insider's game. The University of Alabama-bound southerner opted to include United Parcel Service (UPS)in her portfolio because her father owned the stock when he worked there as a human resources manager. "If someone inside the company wants to own it, that's a good sign," she says. Hannah also chose the Vanguard Social Index (VFTSX), which excludes companies deemed socially and environmentally harmful. But investing with a good conscience doesn't necessarily mean giving up returns. The index Hannah chose is up around 7% this year, a tad higher than the S&P 500.